Fluval has built its reputation by developing technically advanced, innovative products that are easy to use, durable, and convenient. 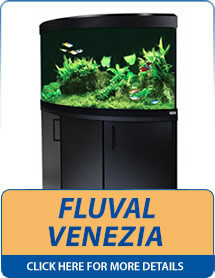 Within the range of Fluval aquariums that we supply at Aquahome are the Roma, the Vicenza and the Venezia corner aquarium. 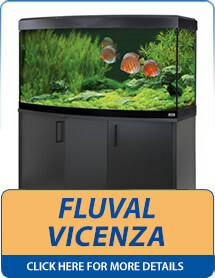 All of the Fluval ranges now come with LED lighting as standard. The Fluval LED aquarium lighting provides superb surface area coverage, and excellent penetration to ensure that ideal lighting levels are met for all tank inhabitants. It promises lower energy consumption and lower costs whilst preserving ideal lighting conditions to promote the health and development of aquatic fish and plants. Don't forget that Aquahome also offer in store finance through Pay4Later which means that you are able to spread the cost of your chosen aquarium over 12 months interest free, or even spread the cost over 2, 3 or 4 years (interest bearing)! For more information please see the Aquahome Returns Policy and In Store Finance Information. 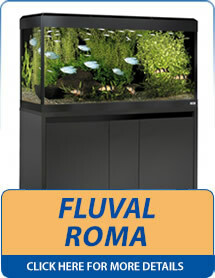 Please click below on the particular Fluval aquariums that you would like to view in more detail.